According to tradition 2008 is the 40th anniversary of the origin of the reggae idiom of Jamaican music. The 1968 release of Toots and the Maytals “Do the Reggay” is said to mark the dawning of what some would love to call the reggae age. The Jamaican government declared February Reggae Month and much adulation was given to artistes like Bob Marley, the dreadlocked superstar who popularised the music internationally. But while reggae has evolved in a dramatic way to now reach its apogee on the world stage, there are many unsung heroes who seem to have fallen by the wayside. Keyboardist extraordinaire, Jackie Mittoo comes to mind. Born Donat Roy Mittoo in Browns Town, in the north coast Jamaican parish of St Ann, on March 3, 1948, he was taught to play the piano at the tender age of four and his musical prowess began to manifest at age 13 when he started playing professionally with much older and experienced musicians even while attending high school, first at York Castle and then Kingston College. It was 1962, and he was the youthful pianist for the famous ska band, the Skatalites. Over the years Jackie proved to be one of the most versatile and eclectic musicians ever to grace what has now proven to be a very musically gifted island, Jamaica. He played a profound role in the evolution of the island’s music from the early days of ska right through to the now world acclaimed reggae. He would become the musical maestro for the reggae cornerstone Studio One, aka Sir Coxson’s Downbeat and Jamaica Record Manufacturing Studio. His musical sojourn has been described as ”what seems to be animated by a tangible electric energy” taking the genre through different stages right there at Coxson’s variously as keyboard player, composer, arranger and producer. I’ve never seen him in any musical fraternity other the aforementioned studio, in those days at Studio One. He, along with bassist/singer Leroy Sibbles, Jackie Jackson of treasure Isle Records, guitarists Hux Brown, Ernie Wranglin and Trinidadian Lynn Taitt, and fellow keyboardist Winston Wright, were responsible for many of our staple reggae beats that have been sampled over and over and are still the food of love to the ears. At Studio One, Mittoo and to a lesser extent Sibbles of the Heptones and the late Clement “Sir Coxsone” Dodd himself had more to do with the formation of our now world class music than any other musicians. 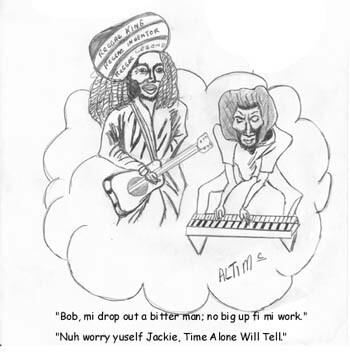 Bob Marley is actually more responsible for spreading the music worldwide, and I’m pretty sure that if Bob were alive today he would willingly testify to Jackie’s prowess since he also experienced his ingenuity at the Coxsone studio. Brian Atkinson, the bassist of the Soul Vendors, Studio One’s 1966-68 band, writes on his Web site, “Ironically, the story of the unsung MOTOWN musicians closely mirrors that of the Soul Vendors, a group of Jamaican musicians who between early 1966 and mid 1968, the golden era of Reggae, either composed and/or recreated all the great rhythms for all the artists at the now famous Studio One in Kingston. My brothers and I observed Jackie’s exploits within the studio and I can recall the famous worldwide hit “Pass the Duchie” by Musical Youth, which was originally formulated by Mittoo and Sibbles as a classical reggae instrumental called ”Full Up” (1968). The first time I heard that piece I knew then that reggae music had arrived. I still believe that the first real reggae song was a tune called “Nanny Goat” by Larry & Alvin backed by the Soul Vendors, although I’m aware that Toots of the Maytals also did a song called ”Do the Reggay”, which many say gave the music a name. We as youngsters were so amazed at each stage the music varied from the popular ska through the slowed down rock steady then finally the more pepped up music with the new addition called the organ shuffle, actually invented by Jackie himself, and eureka! it was now reggae music. Since those early days the music has not changed much. Jackie died a bitter man on December 16 1990, in Toronto, Canada, and although well known by reggae purists was never clothed in the glory he should have for his yeoman contribution to creating the genre.